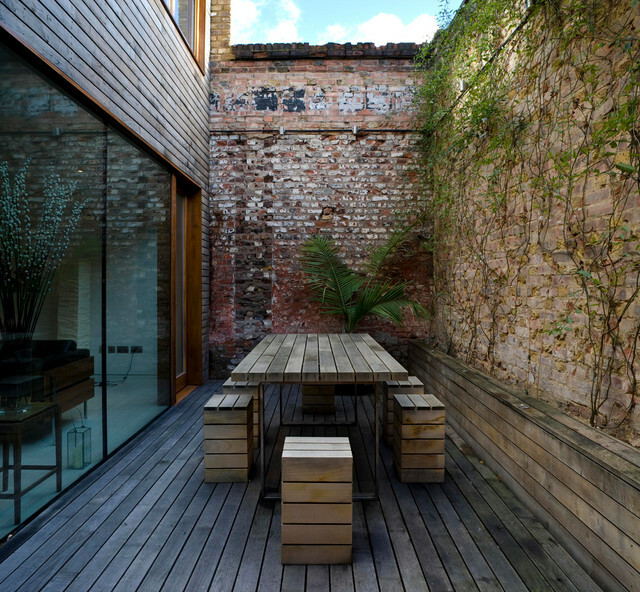 Get the bones right Brick, glass, decking and timber panelling mix well as the structure around this sliver of a courtyard. The design is ripe for expanding upon – a living wall or a well-placed mirror would really add character and impact here – but the basics are spot-on for an urban entertaining space. Herein lies the problem; it is those high walls that run through to the rear of the property that often leave you feeling trapped in your own backyard. Here are a few simple tricks that can help create the illusion of space, and get you outside enjoying your courtyard more. 4. Embrace itProbably the most cost effective way of dealing with an old wall is to embrace it. Even speed up the ageing/deteriorating process and roughen up the face of the wall with a hammer and masonry point – the more marks and imperfections, the better. That rustic and recycled look is very desirable these days! Just be sure to keep it superficial, you don’t want to damage the wall structurally and have it come tumbling down.